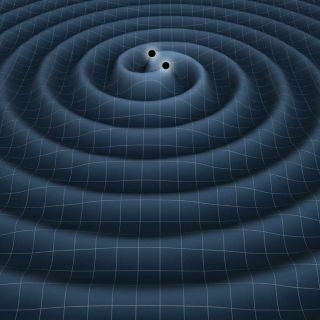 This illustration depicts the gravitational waves generated by two black holes orbiting each other. These mysterious ripples were first proposed by Albert Einstein as part of his theory of general relativity. The waves' size depends on the mass of the objects creating them. Scientists have still not made direct observations of gravitational waves, although researchers continue to endeavor to detect them using experiments involving lasers on the ground and in space. The waves interact very weakly with matter, which partly explains why seeing these ripples in spacetime is difficult. Now, McKernan and his colleagues suggest that gravitational waves could have more of an effect on matter than previously thought, with their influence potentially brightening stars. "It's neat that nearly 100 years after Einstein proposed his theory of general relativity, there are still interesting surprises it can turn up," McKernan told Space.com. "We're brought up as astronomers thinking the interaction between matter and gravitational waves is very weak, essentially negligible, and that turns out not to be true." The researchers suggest that stars that vibrate at the same frequency as gravitational waves passing through them can absorb a large amount of energy from the ripples. "You can imagine gravitational waves as sounds from a piano, and stars as a vibrating violin string held near that piano," McKernan said. "If the frequency of the sounds matches the frequency of the violin string, the string can resonate with the sound." If a star gets pumped up with large amounts of energy from gravitational waves in this way, "the star can puff up and look brighter than it normally would," McKernan said. One challenge is determining whether any star brightening astronomers detect is from gravitational waves or some other factor. The researchers suggest the key to spotting the effects of gravitational waves involves looking at large groups of stars. "When a population of stars is near a system of merging black holes and is getting pounded by gravitational waves, we think that the more massive stars will light up first," McKernan said. "It's like playing keys on a piano and starting with low pitches." As the black holes get closer together, the frequency of the gravitational waves they generate will increase, "and we'd expect to see brightening of smaller stars," he added. "If we see a population of stars where the smaller stars are brightening after the bigger stars in a collective way, that might be a sign of gravitational waves." This research also suggests a different way to indirectly detect gravitational waves. If scientists develop working gravitational wave detectors on Earth or in space, when a star passes in front of powerful sources of gravitational waves such as merging black holes, the detector may see a drop in the intensity of those waves. This will happen if the eclipsing star is vibrating at the right frequency. "You usually think of stars as being eclipsed by something, not the other way around," McKernan said in a statement. McKernan and his colleagues Saavik Ford, Bence Kocsis and Zoltan Haiman detailed their findings online Sept. 22 in the journal Monthly Notices of the Royal Astronomical Society: Letters.